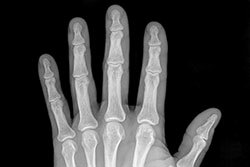 All X-rays are sent out for a radiologist to read. Each x-ray exam costs $25 and will be billed to your student account. No payment is necessary at the time of service. This fee covers the reading by a radiologist. If you need additional imaging (ultrasound, MRI, CT scan, etc. ), you may be referred to the community, such as Mad River Community Hospital in Arcata or Saint Joseph’s Hospital in Eureka. You will be responsible for all costs. Our referral coordinator will work with students to determine if your insurance will cover imaging services in the community prior to sending these referrals.